My friends in the states are always eager to find more Scandinavian products and companies who ship to America. Seems Scandi design has won the hearts of my fellow American friends quite a lot over the years. The clean lines, the simplicity, the quality, it's quite alluring and I must admit to being a sucker of Scandi design myself. 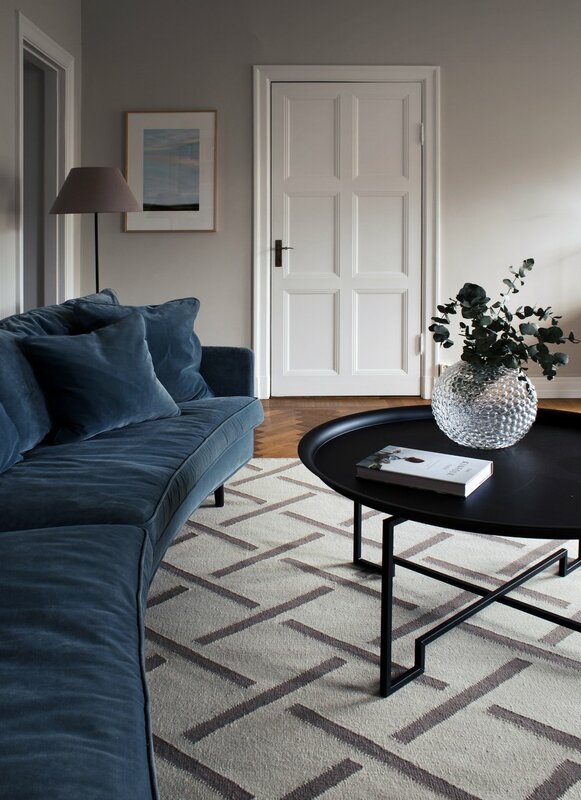 That's why I wanted to talk briefly today about this great company I found who makes gorgeous rugs that won't break the bank, and they're called Nordic Knots (they even ship to the USA for FREE!). Founded by Liza Laserow, Fabian Berglund and Felix Berglund in 2016, Nordic Knots created a family business with a goal to make beautiful rugs with the design inspired by classic Scandinavian patterns while also being affordable. They have a flat weave collection which are skillfully hand woven in 100% high-quality New Zealand wool. They also have a cut-pile selection also made using 100% New Zealand wool. My favorites from their collection include the flat weave show below left, called Mosaik Gray (I love geometric prints) and the TIGER rug, shown right, in black and cream. Spot any rugs that you can imagine in your home? By the way, I hope you are all doing great. We're taking our new car up to Denmark this weekend to break it in for its first official road trip! Weeeee! We are packing tonight and tomorrow and will be staying at the gorgeous home of a good friend of mine to babysit her dog for 8 days. I seriously CANNOT WAIT. The house has a swimming pool AND a golden retriever, so it's a full-service dream house for all three of us - and this weekend is our anniversary too, so it's a great time to get away. My little boy won't stop talking about having a dog and a pool - he has been mentioning it each day since we told him a few weeks ago... So cute. Do you have any summer vacation plans set up? Where will you go?